Welcome to InterContinental The Clement Monterey. 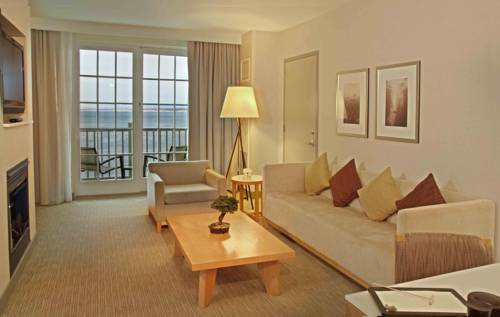 Enjoy panoramic ocean views and radiant sunrises on beautiful Monterey Bay. Overlooking the sapphire waters of Monterey Bay on Cannery Row, our waterfront hotel, resort and spa is where beauty and luxury indulge your senses. Whether you are planning a family vacation, romantic getaway, or special event, InterContinental, the Clement Monterey is an inspiring Monterey Bay hotel with urban energy, modern luxury, and coastal charm. Bistro Moulin: Bistro Moulin is a cozy European Bistro located on Cannery Row in Monterey. French Chef and Owner Didier Dutertre's classic cuisine is exquisitely prepared and French wine selection are plentiful. You'll swear you're in Paris. Childrens's program - Children's state of the art fitness equipment, flat screen TVs, video games and enriching Monterey exploration materials. Cannery Row Boardroom: Features 10 deluxe executive chairs, a fixed boardroom table, featuring a useful sideboard for in-room breaks, and overlooks historic Cannery Row. Pacific Ballroom: Ocean front main ballroom adjacent to pre-function space and outdoor Pacific View Courtyard. Provides a neutral backdrop with imaginative, subtle artwork. Pacific Pre-Function: Ocean view, flexible space, suitable for breaks, receptions, and registrations. A light and airy space providing stunning views of Pacific View Courtyard and Monterey Bay via floor to ceiling windows running along one full side. Pacific View Courtyard: Flexible outdoor space on the Monterey Bay waterfront features two stationary fire pits, and the sites and sounds of the Monterey Bay. Enhancements include teak furniture, heat lamps and overhead market lighting. Library: Private dining or small meeting room with library decor, access Pacific View Courtyard and the C restaurant. Floor to ceiling windows provide plenty of natural light and ocean views. Ocean Terrace Ballroom: Second floor ballroom overlooking the Pacific View Courtyard with optional use of private terrace. Provides panoramic view of the Monterey Bay. Ocean Terrace: Private terrace providing panoramic view of the Monterey Bay, suitable for receptions, meal functions, and outdoor breaks. Hovden: Third largest meeting room featuring private balcony overlooking historic Cannery Row. Flexible setup with large mirror enhancing natural lighting. Del Mar: This room features balcony overlooking historic Cannery Row. Also features attractive alcove suitable for breaks, storage, overflow seating. Flexible setup with large mirror enhancing natural lighting. Edgewater: Features balcony overlooking historic Cannery Row. Flexible setup with large mirror enhancing natural lighting. McAbee: Intimate board room with flexible setup. Conference Bridal Parlor: Multi-functional guest room/bridal-ready room/hospitality suite featuring full bathroom. Features a Murphy bed and opens on to Ocean Terrace. Casual seating, Nespresso machine, and desk. Del Monte Golf CourseDel Monte is a landmark course that has played an instrumental role in popularizing golf out West since its inception in 1897. Monterey Pines Golf ClubMonterey Pines Golf Club's par 69, 18-hole course puts a premium on accuracy without overwhelming the golfer with length. Point Lobos State Preserve"The Greatest Meeting of Land and Water in the World" Landscape artist Francis McComas' bold but justified claim for Point Lobos. All who come here agree that beauty of this tree-clad headland is unequaled.